Results from the DCI Southeastern Championship afternoon show. It's been a great time so far inside the Georgia Dome for the Coltrin & Associates DCI Southeastern Championship afternoon show. Earlier this afternoon we witnessed Esperanza, Seattle Cascades, The Magic, Southwind, Mandarins, Capital Regiment and Blue Stars. After intermission, we enjoyed Crossmen, Colts, Spirit from JSU, Glassmen, Blue Knights, Boston Crusaders and an exhibition from CorpsVets and Jubal. The top four scoring corps from the competing corps from this afternoon's show get to move into the night show, where they will join (in order of performance) Madison Scouts, Santa Clara Vanguard, Carolina Crown, The Cadets, Bluecoats, Phantom Regiment, The Cavaliers and Blue Devils. Tonight's show takes on increased importance as last night's Masters of the Summer Music Games show in Cookeville, Tenn., got rained out during The Cadets' performance. The last four corps in tonight's show didn't get to perform at all last night, so there's a lot more mystery about the Atlanta show tonight than we might have normally had. Moving into tonight's show (in ascending order of score this afternoon and order of performance tonight) is Spirit of JSU, Glassmen, Blue Knights and Boston Crusaders. 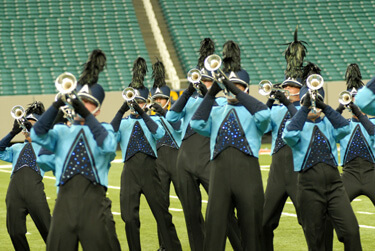 Full scores and recaps are posted on DCI.org. All shows tonight will be streamed live for subscribers to DCI's Season Pass, with APDs available for purchase of each performing corps. Also, live written commentary by DCI Staff Writer Michael Boo is moving from Season Pass to the free side of DCI.org tonight. We will also have many new interviews and other features by intrepid DCI correspondents Christina Mavroudis-Dempsey and Emily Tannert, along with some fresh film features and two-minute snippets from the corps that performed this afternoon. Be sure to join us tonight on DCI.org. This will be the last time all the top Division I corps will face each other until the World Championships in Madison, as the DCI Eastern Eastern Classic performances next weekend are divided between two nights.